Many thanks to all the team members who helped put this together! Preparation for Team Phoenix's mini-build game is underway! The five subteams are currently working on completing individual tasks in order to finish the robot. The team members have been working efficiently in order to finish the individual components of the robot in a timely manner. If all goes as planned, the robot should be complete before Game Day (Saturday, December 6th). During the last two meetings, the mechanical subteam has made quite a bit of headway in terms of machining and assembling the drive train. From sawing and filing to utilizing CAD to design the components of the robot, the framework of the robot is sure to be finished soon. Thanks to the hard work of the wiring subteam, the control board for the robot is now complete. The coding subteam is right on schedule: they have finished the coding for the camera as well as the drive train. The business subteam has been working in order to prepare the entire team for the FLL tournament as well as other outreach opportunities. A schedule has been laid out by the systems subteam, and is updated whenever necessary, to ensure the utmost accuracy. In addition to working individually, the subteams have been collaborating throughout the course of the project. The collaboration between the subteams is a crucial element of the mini-build season. It is also great preparation for the build season, which will commence in early January. Being well acquainted with not only one's own work but the work of others is not only beneficial but also necessary. After all, a team is greater than the sum of its parts. Christmas is right around the corner! Whether it be a paperback book hot off the presses or an ultra-portable book for Nook, our Barnes and Noble fundraiser is sure to help you to find the perfect gift for everyone, this holiday season! Come visit us on December 4th from 6pm to 8pm at Barnes and Noble. If you can't make it to the fair, please visit the Barnes and Noble website to support us online from December 4th to December 8th. The following code can be used at the checkout in-store or online: bookfair ID 11359767. The Systems subteam created a game in order to practice picking up objects and maneuvering around obstacles. The object of the game is to pick up (and transport) as many tennis balls as possible from one end of the 16' x 20' field to the other. 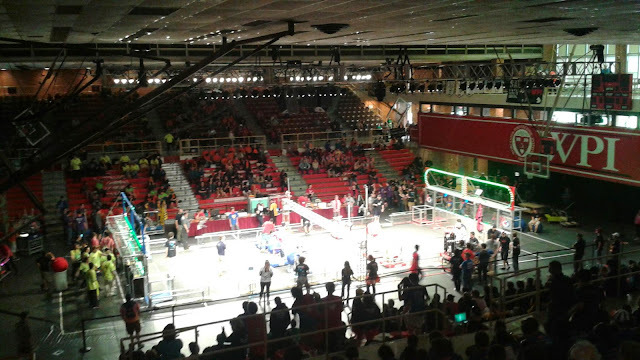 Each match lasts for two minutes: teams must drive a robot (with or without a camera) in order to score as many points as they can during this time duration. This mini-build game was designed with specific goals in mind. 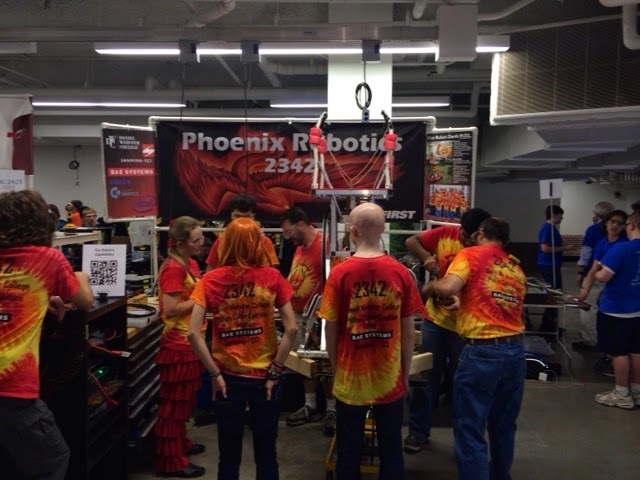 In addition to practicing for the build season, the challenge was created to promote teamwork and a general feeling of enthusiasm among the many members of Phoenix Robotics. After brainstorming extensively, our team determined that we would build a medium-sized robot with a frame size of 18" by 26" in order to accomplish this task. The team felt that maneuverability and speed were both important in this challenge. In addition, the robot was designed to be durable so that damage would not be inflicted if the robot collided with an obstacle. The drive train of the robot features drive wheels as well as omni wheels. The omni wheels increase maneuverability while the drive wheels allow the robot to have traction. A roller with bristles is used to pick up the ball and keep it in place. It spins counterclockwise in order to accomplish this. In order to place the tennis ball into the goal on the opposite side of the field, the roller may be spun in the clockwise direction. 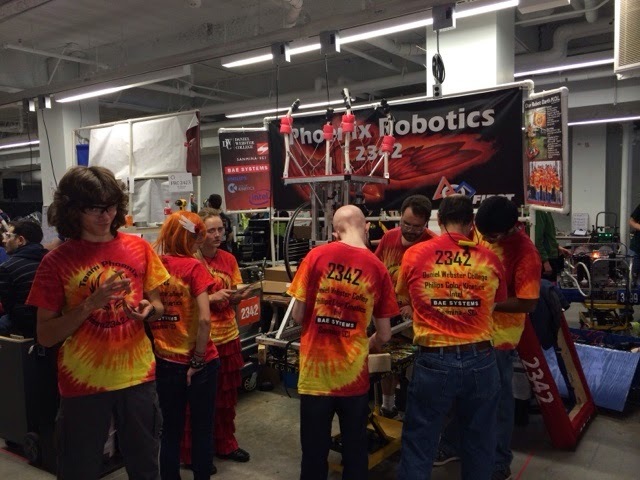 The team is currently hard at work, in terms of constructing the various components of the robot. The five subteams are using a "divide and conquer" approach in order to accomplish this task. After fifteen more hours in meetings, a fully functioning robot is scheduled to be ready for the mini-build game, which we are awaiting with great excitement and anticipation. New member looking for a registration form? This the post for you. Simply go to www.team2342.org/sign-up and follow the instructions. We even fixed our sponsor panel. Isn't it pretty? 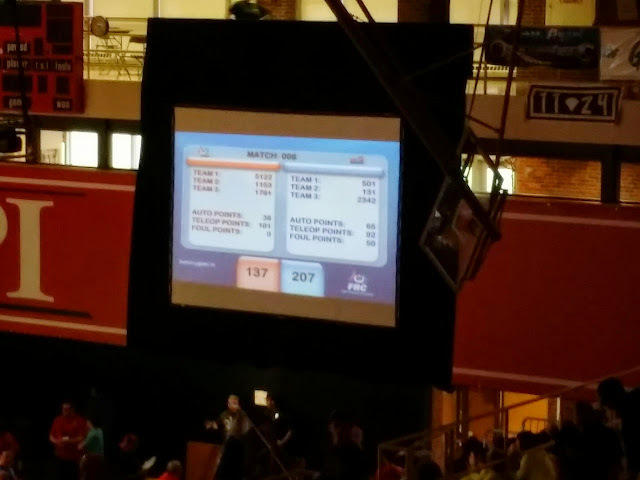 Our alliance was one robot short (2342 partnered with 131), but both robots scored in autonomous and we finished the match with twice as many points as the other 3-bot alliance. At Mayhem on the Merrimack. Having trouble with the elevation drive but we think we fixed it. Another win and an awesome match! We won 187 to 47! And autonomous worked!!! You can really hear the Cry of Battle here at BattleCry! Join us! 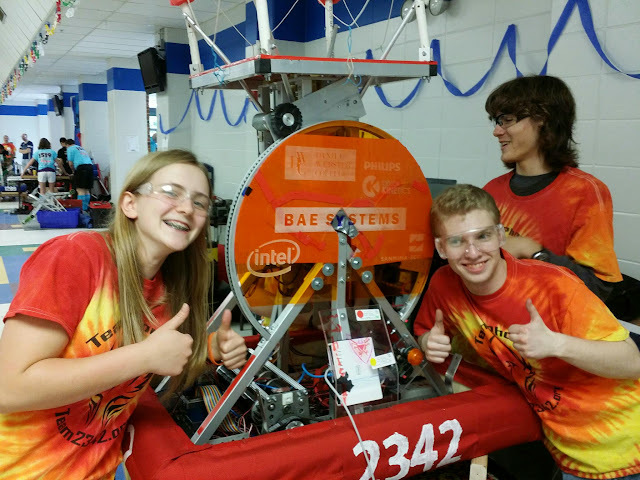 FIRST Robotics Team 2342 is having three open houses on Thursday, August 28th, Thursday, September 4th, and Tuesday, September 9th. Click here for more information. We Won the Judges Award! Team 2342 has won the Judges Award from the 2014 Pine Tree District Event! This Team provides a unique opportunity for students from traditional and nontraditional educational environments to connect, work together, building their shot for the future. 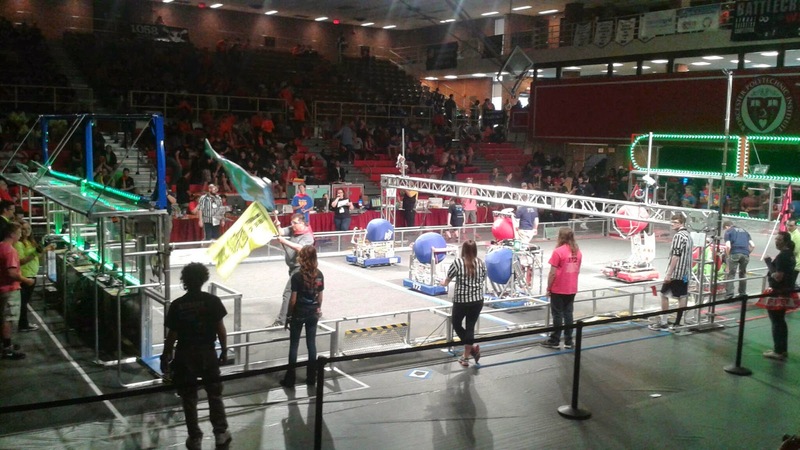 Their team crosses formal boarders with their reach as great as the shot of their bot Darth M.O.L.